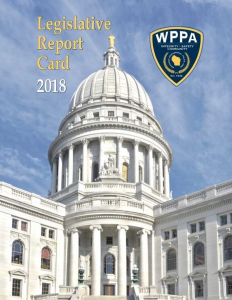 On September 28th, the WPPA released its biennial report card ranking Wisconsin’s lawmakers for their support during the 2017-18 legislative session. The rankings are the product of a cumulative scoring methodology that awards and deducts points to lawmakers for their actions at every stage of the legislative process on each bill for which the WPPA registered its support or opposition with the State Ethics Commission. The approach recognizes lawmakers for the bills and amendments they introduce, their committee votes, and their votes on the floors of their respective chambers. In addition to ranking legislators in both the State Assembly and Senate, the report card also announced which lawmakers had been named to its “Law Enforcement Honor Roll,” and that it had awarded the “WPPA Legislator of the Year” distinction to State Senator Van Wanggaard and State Representative André Jacque. With more than 10,000 members from nearly 300 local association affiliates, the WPPA is the state’s largest law enforcement group. Anyone with questions or comments is encouraged to contact WPPA Executive Director Jim Palmer at by telephone at 608-273-3840 or by e-mail at .